This is a really simple and flexible pattern. 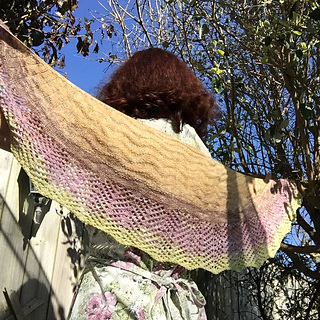 You can use any yarn weight, there are no instructions for yarnweight or yardage: use the yarn you want to and follow the instructions to get a decent size shawl. Its size is highly adjustable, only depends on your needs and purposes. 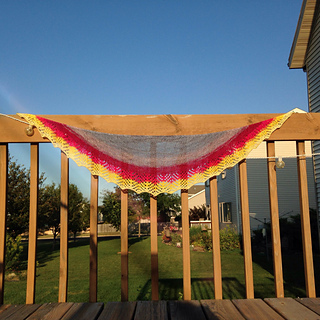 The shawl shows the beauty of a long color changing yarn, but you can use solid yarns too . 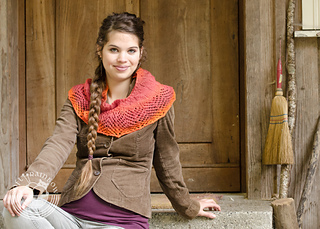 Make the body and the border contrasting, or keep everything in tone. Schoppel Wolle Gradient (100% wool 284 yds 260 m / 100g). 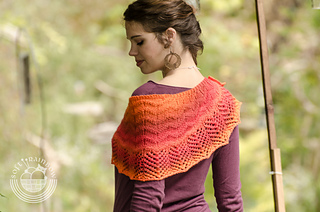 Colorway: Indian Summer. 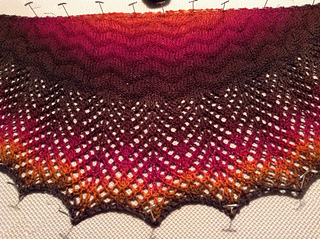 Nearly a whole skein. Use anything that you have in stash. How much? The exact amount you have! I give tips for adjusting the pattern to your yardage. Colors: solid, semisolid, gradient, self striping. I would only not recommand the very busy variageted yarns. US 7 [4,5 mm], 32” [80 cm] long circular needles. Use the needle size that suits your yarn. 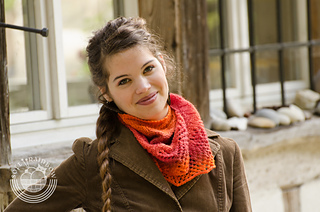 You can also use a little looser gauge than you would choose for a sweater. Wingspan at the top: 39 ½” [100 cm], depth: 11” [28 cm]. Please note that in this particular project getting the right gauge is not essential. 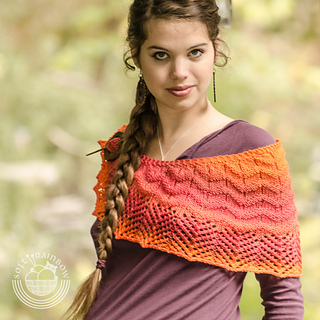 However, working with different yarn weight / gauge will effect both the yardage and the final size of the project. Beginner. 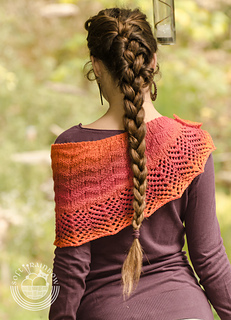 You have to knit, purl, and work simple lace pattern.